As with furniture, fine and decorative art, buying jewelry at auctions is a great way to learn as well as often secure great pricing. 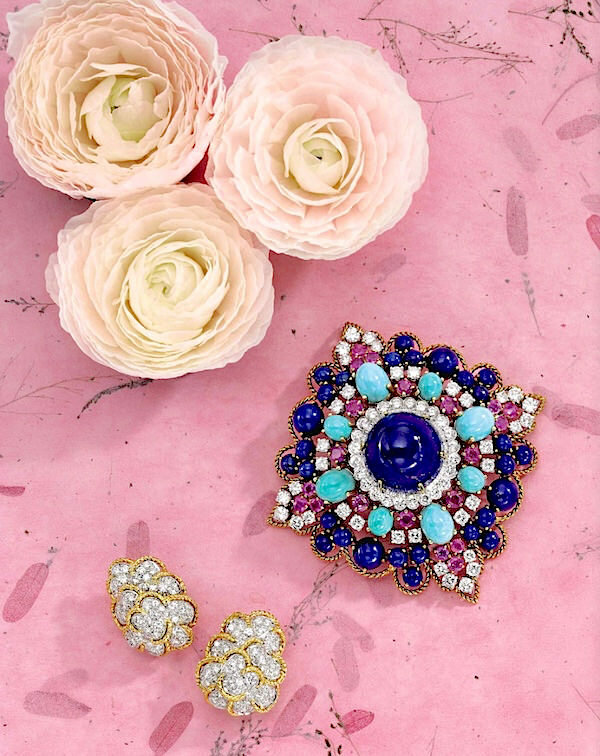 Sotheby’s Fine Jewels Auction in New York City on June 10, preceded by a three day exhibition, has a marvelous selection of stylish examples from such distinguished names as Tiffany’s, David Webb, Cartier and Van Cleef & Arpels and Verdura. The allure of David Webb‘s fantastical creations has never died and his iconic enamel and jeweled animal bracelets are his most famous. The bedazzled bull above, enhanced with round diamonds and oval-shaped and cabochon rubies, is shown with a classic onyx quatrefoil Van Cleef Alhambra necklace. 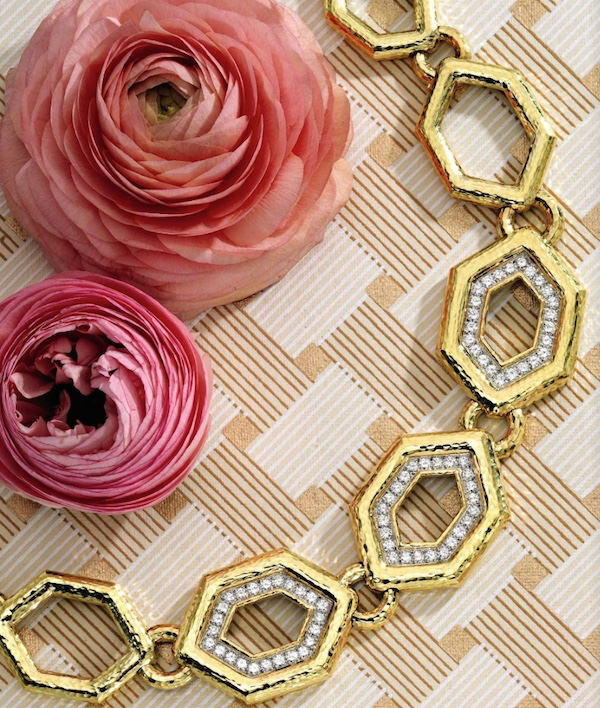 David Webb also expressed his love of yellow gold through bold and graphic statement pieces like the diamond and hammered gold hexagonal linked necklace below, part of a suite with coordinating earrings and cuff. Many other iconic names in the world of fine jewelry are included in the auction. 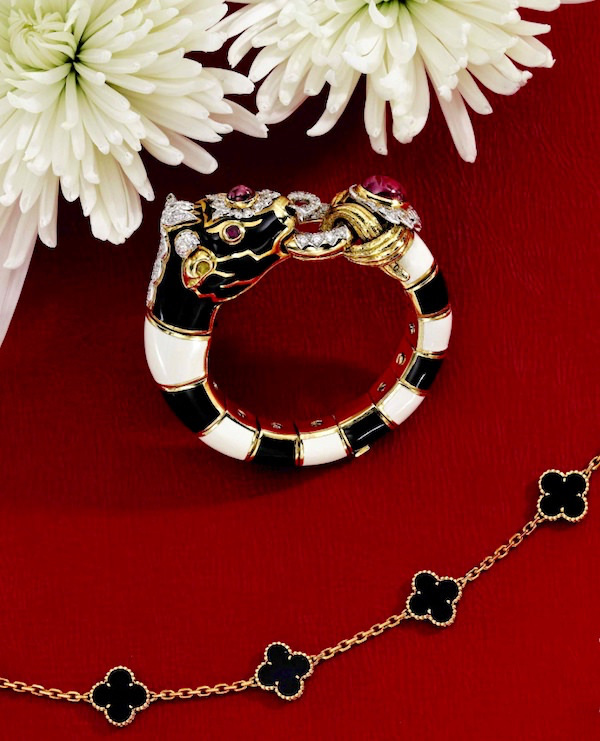 Aldo Cipullo is perhaps most famous for his Love Bracelet that he designed for Cartier in 1969, as well as the much imitated “Juste un Clou” bracelet which Cartier reissued and expanded upon in 2012. But the young Italian jeweler, who died much before his time, also worked for Tiffany and David Webb as well as on his own, creating jewelry often imbued with symbolism, always bold and never fussy. 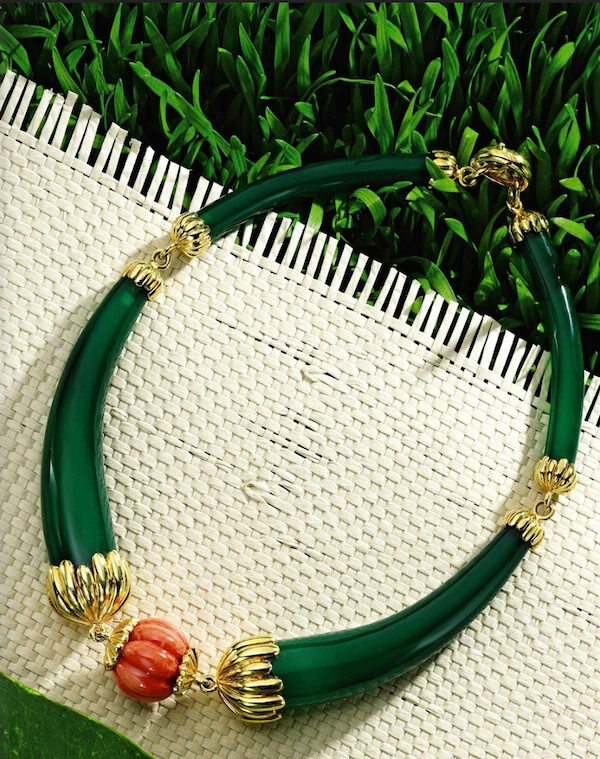 An elegant gold, chrysoprase and coral necklace he designed for Cartier, below, is included in the auction. Parisian jeweler René Boivin was a pioneer in creating innovative and fashion forward jewels. In the early 20th century, he designed for many of the couture collections in Paris as well as such fashion icons as Elsa Schiaparelli and Diana Vreeland. The spectacular gold, freshwater pearl and diamond “Hindu” bracelet included in the auction, below, is from the collection of philanthropists Mamdouha and Elmer Holmes Bobst, as is the amazing Marianne Ostier brooch following (a stunning and classic design compared to many of her artsier pieces). 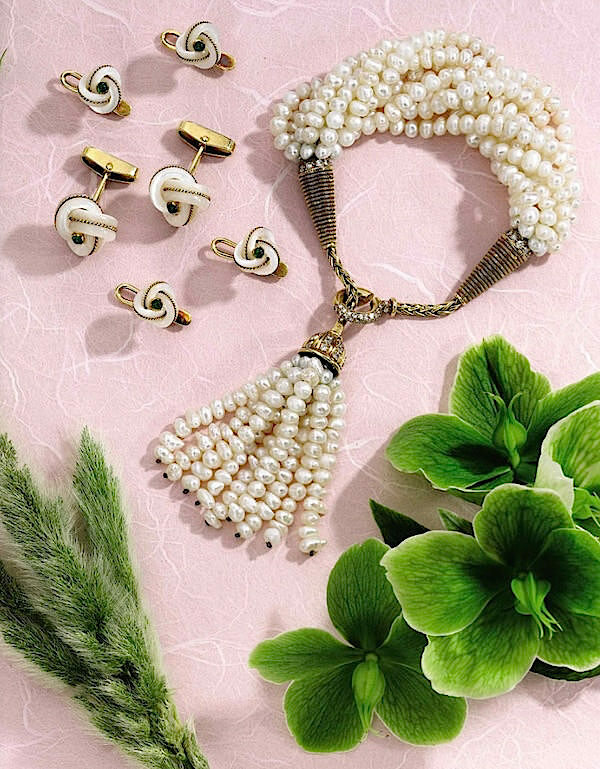 The bracelet, above, is shown with a mother of pearl, diamond and emerald Van Cleef dress set of cufflinks and four studs and the brooch, below, is paired with Van Cleef gold, platinum and diamond earclips. Contemporary Italian jewelry Margherita Burgener is a master goldsmith whose creations are modern yet based on a century of family craftsmanship. With inspiration from nature, her handcrafted pieces often combine new metals with carefully selected stones, as seen in the purple titanium, gold and diamond cuff in the auction, below. 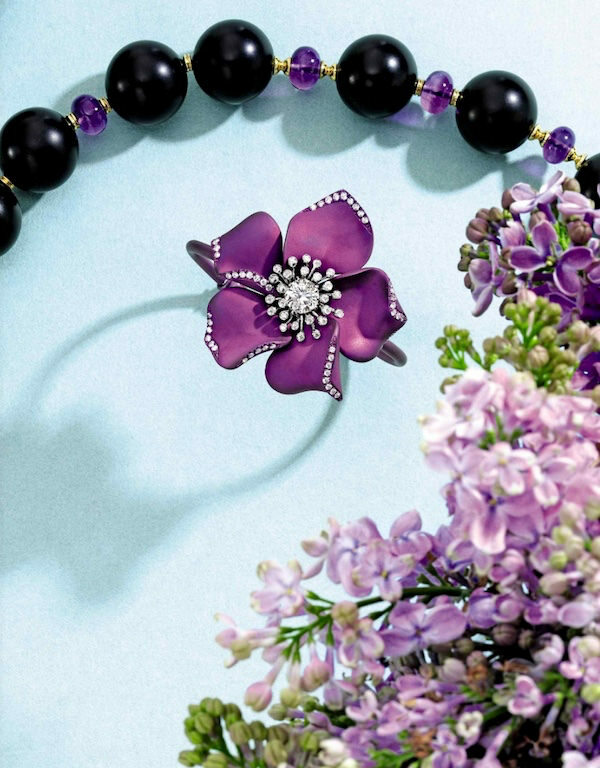 While not included in one of the styled shots, I am crazy about this “Ludo Hexagone” Van Cleef bracelet. 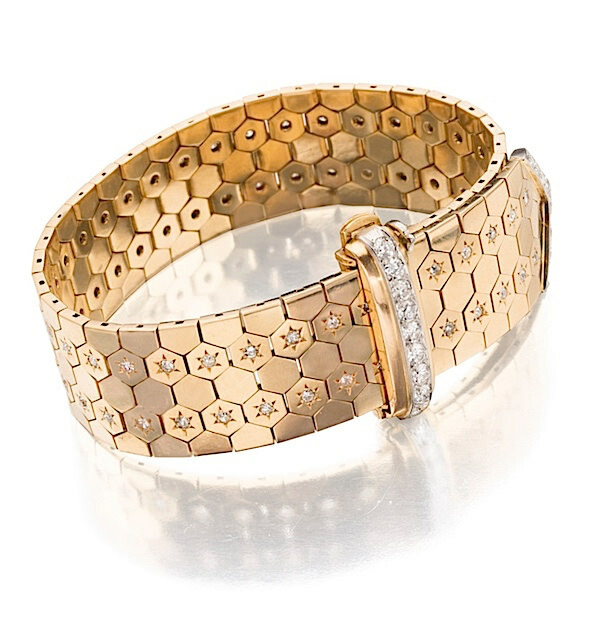 With a flexible strap of 18 karat gold in a hexagonal honeycomb pattern, two rows feature star shapes set with single-cut diamonds. The strap design is such a timeless understated classic from the 1940’s that can go from day to night with effortless style. 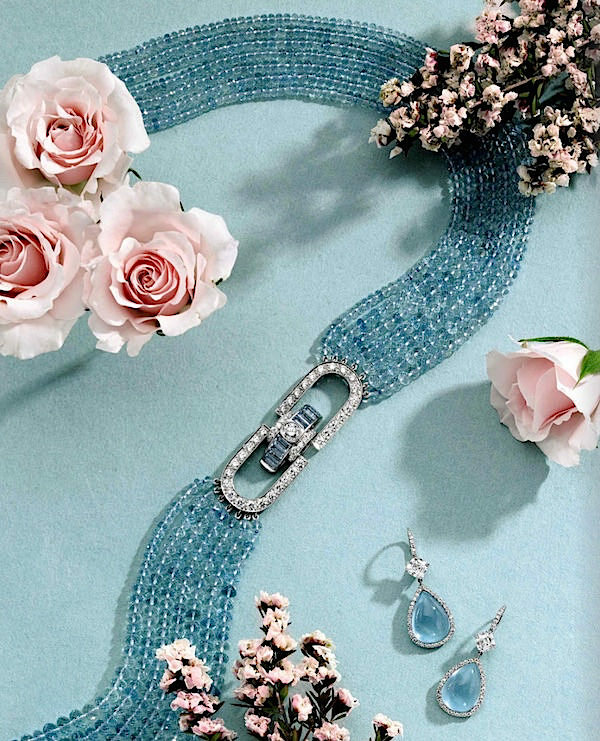 The Sotheby’s Fine Jewels Auction also includes non-wearable jeweled pieces. 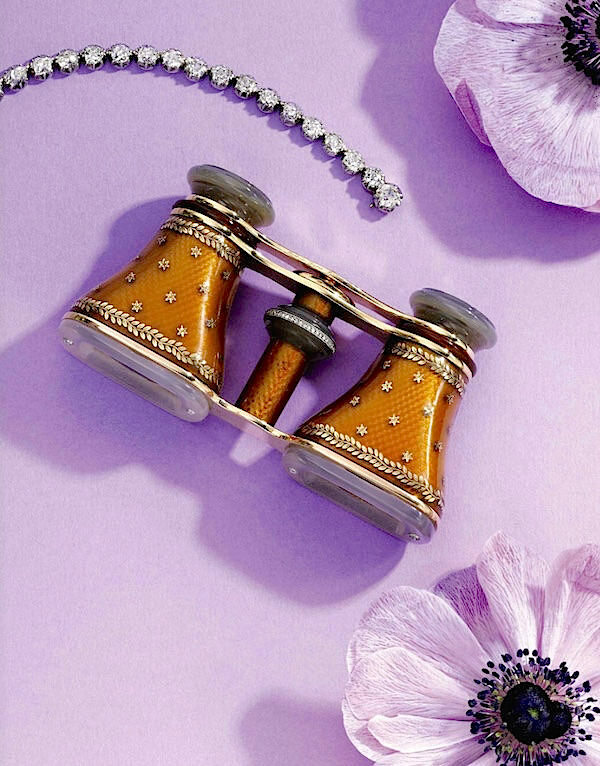 If you are or know an opera aficionado, then you might want to put these gorgeous gold, enamel, agate and diamond 1915 Cartier opera glasses on your list. In the chic interbellum years, women of means carried exquisite vanity cases. This beautiful gold, lapis lazuli, enamel and diamond example from Black Starr & Frost shows period art deco details in its design. 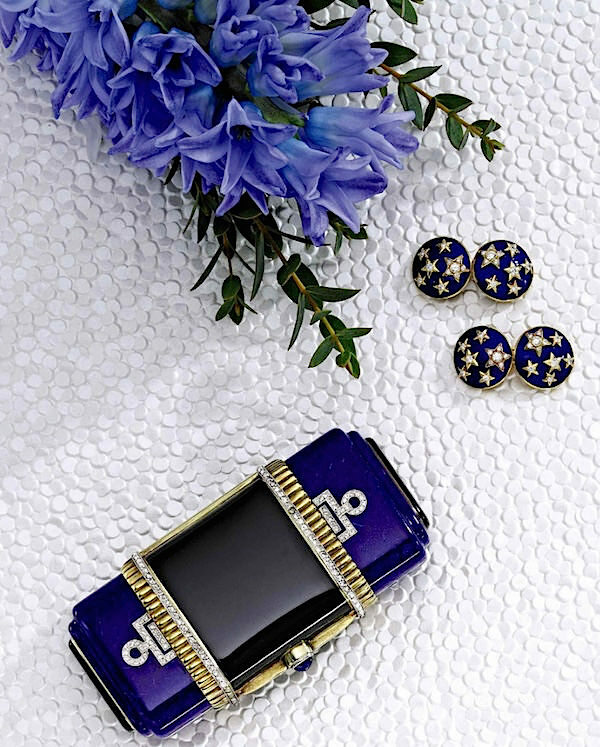 Fitted with a mirror, two compartments and a lipstick holder, it was all an elegant lady needed for an evening out. Thanks Frank – it’s never too late to start a great collection! This entry posted in auctions, fashion, jewelry. Entry Tags: auctions, fine jewelry, Jewelry, Sotheby's Bookmark the permalink. What amazing pieces you got me at the aquamarine necklace, but I’m glad I held on for the hindu pearl bracelet… how amazing! Thanks for sharing this. I love artful jewelry. Gorgeous! When I will debt free I will go to buy a perfect jewelery from an auction. An old stylish piece. My dream! Beautifully styled shots, just as you said. 83 queries in 1.062 seconds.